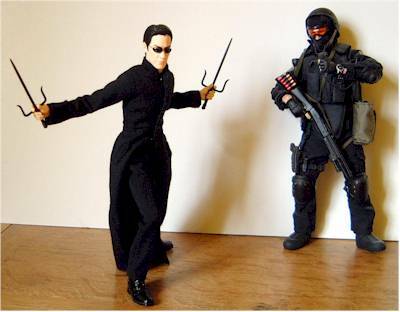 Jeff Parker is back tonight with another terrific sixth scale review - this time it's Medicom's Neo! Take it away, Jeff! 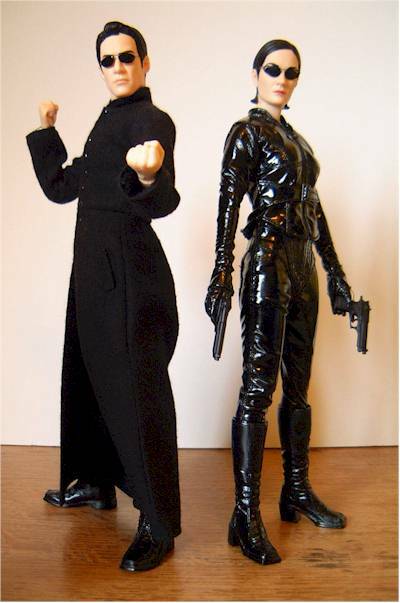 Well I said in my review of the camo ZMDC that I'd do more reviews for my 'older figures' so I'm staying true to my word (so far) Here's a review fora figure that came out just over a year ago (Jan 2004 to be precise, though it was meant to ship in 2003, hence it's limited number of, you guessed it 2003) and I shall be following it with a review of the Trinity figure that accompanies it in the next week or so. 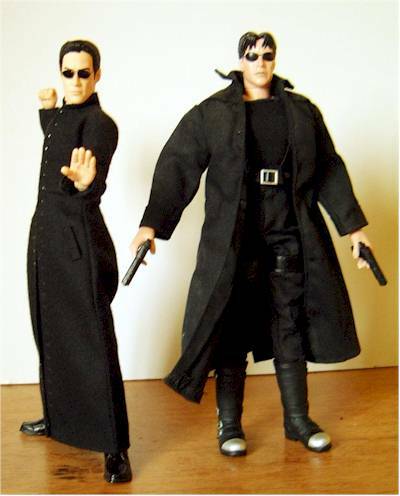 Now a lot of us will remember, and indeed own the dreadful N2 Matrix figures that came out just after the original movie, well I say dreadful, I've seen worse. But for such a great license at a time when that film was on the crest of a wave (soon to be all washed up when the two less than inspirational sequels hit the shore) they could have given us some spectacular figures.....but didn't! 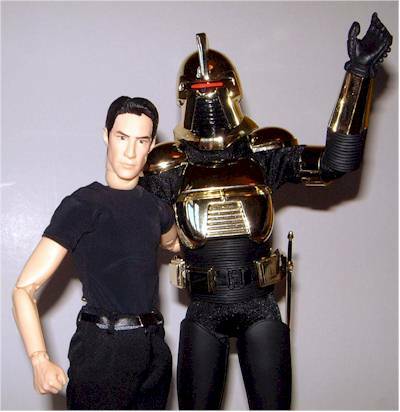 Then there was the Hot Toys Famous Type, dare I say bootleg, figure that followed. Now I don't own one of these (I'm constantly working on that, but we all have to have a cut-off point) but it looks preeeeeetty cool compared to the N2 offerings. Then I saw this, admittedly he's wearing an outfit from 'Reloaded' the weakest of the trilogy, but they have done him sooooooo well. As always nothing's perfect, well hardly ever! 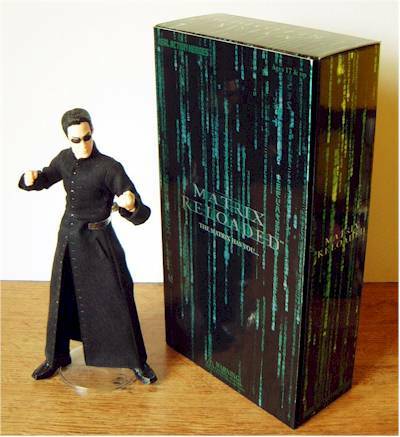 I have a feeling this is the first Medicom figure that I've given a perfect score for packaging and they deserve it. Nice glossy pearlescent full colour printed box with an all over Matrix code streaming text effect. Lots of production crew notes on the back, where it tells us this is in an edition of 2003 and also bizarrely telling us it's not for children under 17, sorry all you 16 year olds and under, but hey, I don't make the rules! Open up the flap and on the left you have pics of the figure showing signature poses and how to hold the weapons, OK I admit holding a sword ain't that hard but with the sais you have to wrap you index fingers round the handle guard, I didn't know this and if you're honest neither did you, unless of course you happen to be Jackie Chan, in which case sorry. 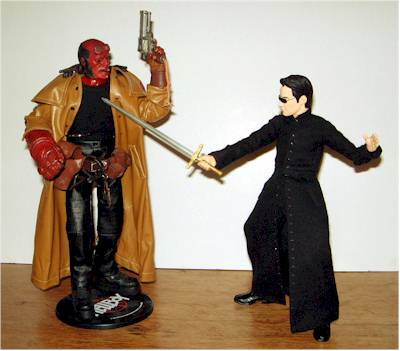 Then on the right lies Neo, his sword, pair of sais and four alternate hands. Behind the plastic tray is the obligatory Medicom clear plastic stand, luckily not needed to keep him upright, but good for jumping poses. 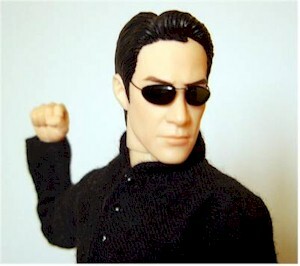 This is without a doubt the best Noo/Keanu sculpt I've seen, the McFarlane ones were cool for their scale, but this is great, to get the full effect you kind of have to remove the shades and as they are constructed of ultra thin wire, getting them off and on ain't for the faint hearted, and as the figure ultimately looks cooler with them on, do ya wanna risk it, you gotta ask yerself, do ya feel lucky punk! Next are the hands, six counting the ones attached, Medicom rarely scrimp on hand sculpts, and in fact I don't think I have two identical hands with any of my figures, nice attention to detail. There are two fists, three in gripping positions (1 for sword, 2 for sais) and a flat Karate/'stop right there' kind of position. 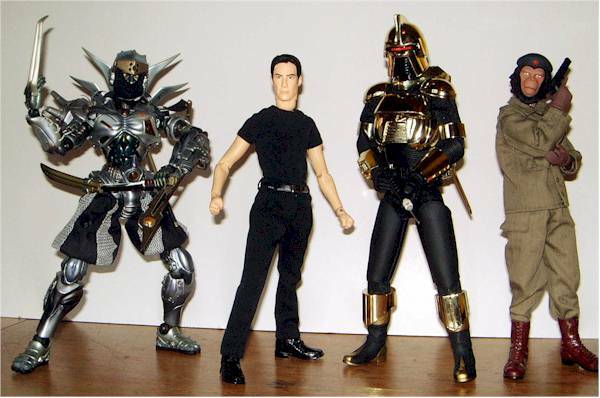 All are sculpted well and hold their allotted weapons absolutely perfectly. Fairly basic paint ops, but as always very tight, very simple, and very accurate. 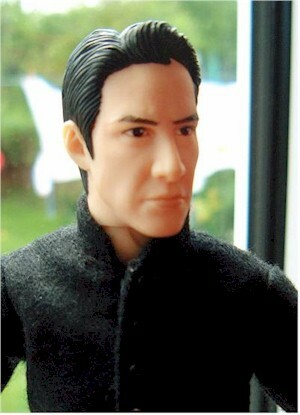 No detailing on the hair but it's sculpted so well it isn't necessary. The eyes, though hidden by the shades, are crisp and clean. Nothing to complain about, but nothing to get too excited about either. 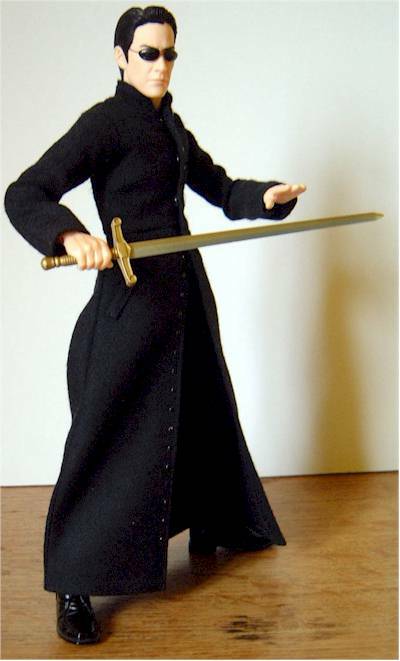 He comes with the new DX type body, so if you look back at either my Luke Skywalker or Andy Warhol reviews you will get a pretty good idea what's going on under that priests coat of his. The only reason for dropping a whole star is because of the tight tailoring of his aforementioned coat, he can't stand with his arms flat by his sides, but instead has to stand like those rather unfortunate people who do too many weights, and stand like their arms are magnetically opposed to going flat by their sides, you know what I mean....don't you? Apart from this annoying detail otherwise perfect, as I hope you can see from the photos he can stand in pretty much any position a human can, and looks anatomically well proportioned......wish I could say the same! 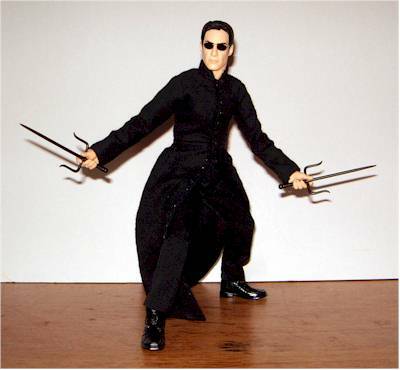 As I mentioned above, he comes with one sword, two sais, four alternate hands, a clear plastic base and a pair of shades, the shades are on the figure when you get it, taking them off is possible but tricky as the wire arms slide into small pin holes hidden in his hair line. So all in all, the accessories are more than adequate, with the stand out piece being the shades. they're fragile but scaled perfectly. A definite 4 stars, the pants, belt, T-shirt, shoes and socks are all excellent, but the priest-style coat is tailored fantastically. I know this may sound contradictory as I docked a point from articulation because of the close fitting sleeves hampering his ability to stand with his arm by his side, but I blame the figure's construction for this. 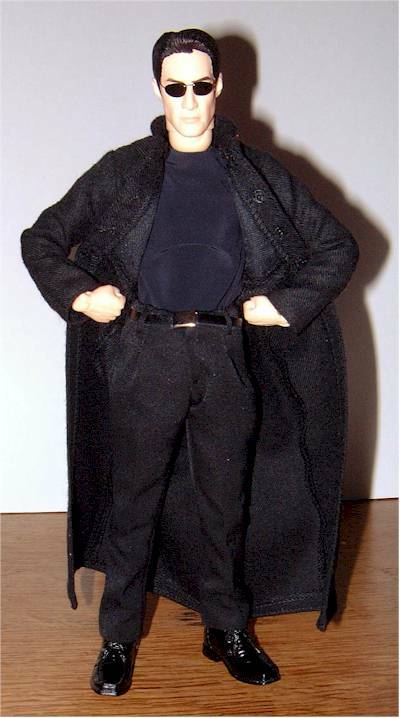 I have tried this coat on other figures (Sideshows 'Renfield' to be precise, and he had no such problem). So after the head sculpt I think this is the figures second strongest area. For all those people disappointed by the N2 range, or who couldn't get hold of the Hot Toys bootleg, this could be what you've been looking for. 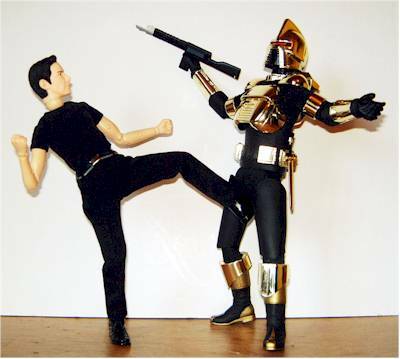 That said, as always with Medicom he don't come cheap. And as he's been out for well over a year now the price is going up and up. But if you bite the bullet and feel it's one you wanted to splash out on, I don't think you'll be too disappointed. 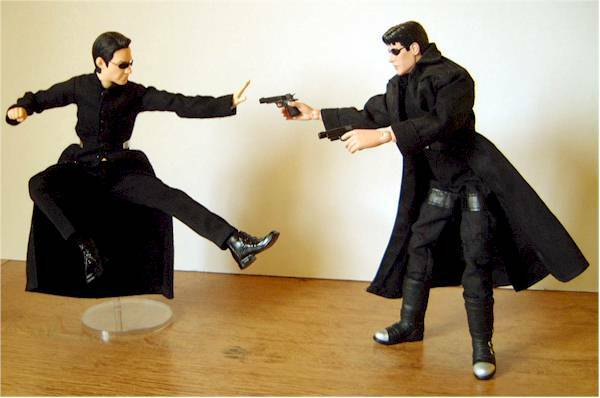 This really is dependent on how big a fan of the Matrix you are or top end quality figures. I favour the latter. I bought him in a deal with the Trinity figure on pre-order and paid $239.00 for the pair. They seem to go on eBay these days for Neo $180 to $220 and Trinity for $120 to $150. I have to admit, if I was going to have to pay that much for him I'd drop another star. Crushed packaging and wonky eyes on Anakin. Otherwise, enjoy! While I'm pretty happy with this figure's quality, his price and those annoying arms keep him a whole star from being perfect. That said he passes my ultimate test of worthiness and gets shelf space, if you look at the pic at the bottom of my bbi U2 pilot review, that's him, bottom shelf about 9 or 10 from the right. He often crops up on eBay at price around those mentioned above. I've also just found him on the Popsalute web site here for $146.88.